Hi Babes! Anyone have a gazillion Christmas parties to attend this year? Need a quick hostess gift. Here are my picks from Target which anyone can easily order online now or pop into your local Target store and pick up right before the party. If you are anything like me you can never come empty handed. You cant go wrong with any of these cheap picks for under $20. 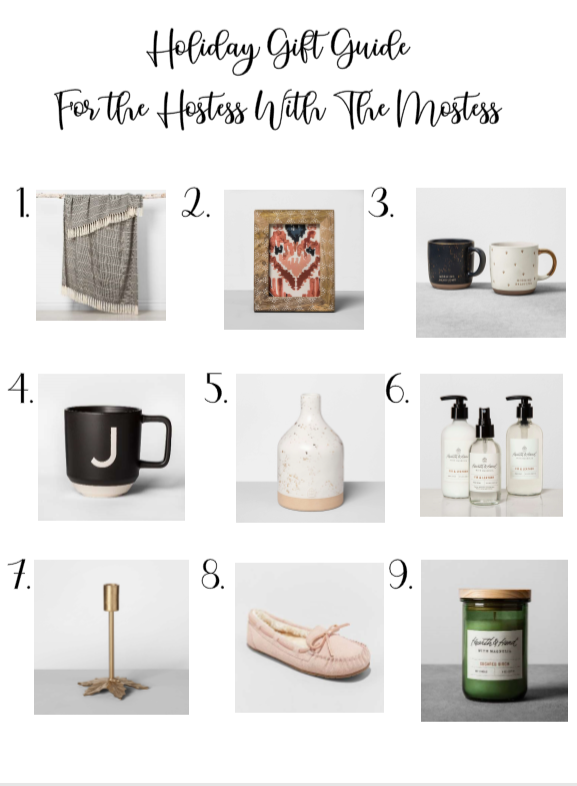 I hope you enjoy this gift guide for the hostess with the mostess. 1. Woven Striped Throw Blanket– Everyone loves a cute new throw. This is neutral and will go with any décor. It is from my favorite brand Opalhouse. So cute and modern! 2. Carved Wood Dot Pattern Frame-This frame is also from Opalhouse. It is a unique gift that anyone would love. Everyone loves a new frame and they will love this quick update to their frame collection. 3. Hearth & Hand Mug Set– This his and hers mug set from Magnolia is so adorable. I love getting new mugs especially a his and hers set. They are so fun and perfect for the tea or coffee lover. 4. Monogram Stoneware Mug– I had to add two mugs this year because its winter time and they are the best little gifts. Who doesn’t love a monogrammed mug? You just cant go wrong. These are also great for gifts for the office. Fill them with cookies and a cute bow and your done. Adorable! 5. Speckled Jug Vase– This adorable vase from Magnolia home is so modern and chic. You can bring this with fresh flowers already in it if you are really looking to impress. So fun and such a great price. Great for the flower lover. 6. Fir & Leather Bath and Body Gift Set– This little gift set is a no brainer for anyone. This set comes with a hand soap, lotion, and room spray. It smells so delicious. Anyone would be happy to receive this. 7. Leaf Candle Stick Holder– I love these candle sticks so much. They are so great for both Thanksgiving and Christmas, you can really use them all year if you wanted. Perfect gift for the candle lover. 9. Lidded Jar Candle-You cant go wrong giving anyone a yummy smelling candle. Sugared birch is my favorite scent but they come in a bunch of other scents. If you just want something little to bring this is perfect. I love getting candles because it is always a quick update to any bathroom in the house. 10. A Bottle of Wine-You can’t go wrong with bringing over a bottle of wine. No link needed as you can just pick up your favorite. Super simple and easy and you cant go wrong. Great gift for any wine-o. I would pick up a festive wine bag to put it in.